Before I start describing the different kinds of Japanese tea, I would like to make a remark of principle importance for every tea-lover. Japanese teas are rather undemanding. They easily survive hard and over-boiled water, they can be drunk from any ware and brewed in any ware, the proportion of tea leaves and water can be any — depending on how strong you like it. Japanese teas combine with different snacks — starting from traditional Japanese sweets and ending with ordinary cookies and sandwiches. In short, one can experiment with these teas any way one likes. There is only one rule to be obeyed very strictly. Japanese tea is brewed for 60 seconds maximum. Often — for only 30 seconds. It is a very important rule. Only freshly brewed Japanese tea opens all its worth — the unusual flavor, soft taste, wonderful color, and incredible froth. If Japanese tea is over-brewed, it becomes muddy, bitter, and loses its froth — in a word, all pleasure is spoiled. Remember this. There are not that many kinds of Japanese tea — but they are all different, easy to tell one from another, easy to remember, and easy to choose one’s favorite. By the way, traditional Japanese teas are only green — even if they are fulvous in color — it is the result of some specific processing, not of fermentation. Another ‘by the way’ — many kinds of Japanese tea have the ‘cha’ syllable in their names. It is only explicable; ‘cha’ stands for ‘tea’ in Japanese. The most popular kinds of Japanese tea are the following. 1. 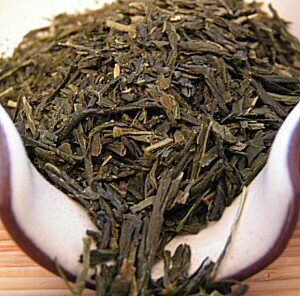 Sencha is the most widespread, the simplest, and the main kind of Japanese green tea. This kind has many varieties; it serves as a basis for several other teas. Of all Japanese teas, Sencha is the most usual for the European customer, because, as a matter of fact — it is an ordinary green tea. With all different nuances of taste and flavor — yet still ordinary. So, if you like green tea — then most probably you will like Sencha. As well as any other tea, Sencha can be of high and not that high quality. The extremes (the simplest Sencha and the highest-quality Sencha) have even developed into separate kinds of tea. 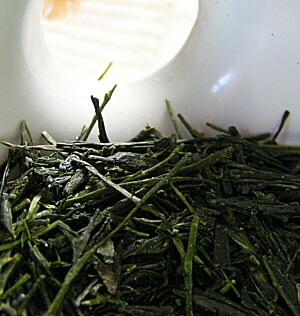 Sencha of good quality can be distinguished by specific tea leaves — they look like flattened tubes of fresh green color. Even the best Sencha may have peculiar ‘tea powder’. Do not worry about that — the common feature of almost all Japanese teas is that their tea leaves crumble very easily. Sencha’s tea leaves can be easily crumbled up into powder, so, this ‘tea dust’ in a tea bag is not ‘sweepings’, but noble dust, if one may say so. Brew Sencha (just as any other Japanese tea) preferably in a china teapot, and use either china or transparent glass tea cups for drinking. The white color (at least of the inner side of the cup) or the transparency of cups are very important — when brewed, Japanese green teas give such a vivid green color as no other tea can give — so, do not deny yourself the pleasure of feasting your eyes upon it. The procedure of brewing is very easy. Put dry tea into a teapot (1 teaspoonful of tea per 250-300 ml of water), pour hot water (about 90 C°), and stir. If you get thick froth at this stage — everything is going right. If there is no froth, then, most probably, something is wrong with the water — it is either not hot enough, or too hard. As was said before, the optimal time for brewing Sencha is 30-60 seconds. After the tea is brewed, pour all tea at once from the teapot into cups, do not let tea leaves stay in water. When tea is in cups it is not diluted with water — if the proportion was 1 teaspoonful tea per 200-300 ml water, it is unnecessary. But if the proportion was different, and tea is too strong, diluting will not spoil it. It will just bring about some confusion into tea-drinking. Sencha is the only Japanese tea which can be brewed repeatedly. Pour water again into the teapot and let it draw for a very little while (20-30 seconds), then pour out everything at once again. I would not recommend you do this — the most delicious is the first brew, anyway. Contemplation of Sencha in a white or transparent cup, especially in bright sun light, is a rare and unmatched pleasure. Soft, velvety, fine green color with golden hues, light thickness (the result of that very tea dust), and circles of smallest tea leaves at the bottom of the cup — all these sudden ‘visual effects’ are surprising and a little frightening at the first tasting of Sencha, and very pleasing at the following ones. To finish up the story of Sencha, I may note once again that Sencha is the simplest and the most obvious Japanese green tea. So, if you have decided to get acquainted with Japanese tea culture thoroughly — better start with Sencha. 2. Bancha. Speaking about this kind of Japanese tea, I can restrict myself to several phrases only. Primarily because Bancha is Sencha, just cruder. The ‘crudeness’ is most often explained by the fact that the tea leaves used for Bancha are coarser. Second, Bancha is almost in full consumed on the territory of Japan and is very rarely imported. It is worth trying only from collection considerations — Sencha surpasses it by all means. The only advantage of Bancha is its cheapness. In Japan, it is an every day afternoon drink, used to wash down lunch. 3. Gyokuro. This kind of Japanese tea is an antipode of Bancha. Gyokuro may be called elite Sencha. Most often to prepare this tea they use tea leaves with artificially prolonged maturing term. Usually, tea bushes are shaded, their growth is slowed down — and a larger amount of aromatic substances and other useful things accumulate in tea leaves. It is customary to believe that Gyokuro stimulates the activity of the brain — that is why this tea is often referred to as ‘the Tea of Genii’. The taste and flavor of Gyokuro are the taste and flavor of Sencha but with one essential reservation. Gyokuro is the tea of nuances. These nuances emphasize basic taste-and-flavor characteristics of the drink and give it certain peculiarity. The peculiarity depends on tons of reasons — the region where the tea was grown and plucked, the weather, the minute details of processing. Moreover, the same reasons determine the color of the tea leaves — it can vary from dark-green to golden-green. All these minute details make Gyokuro quite an expensive tea; many Japanese keep it at home but drink it only on special occasions. Or treat the dearest guests to it. Gyokuro is the only Japanese tea which can be brewed quite long — up to three minutes. Here I may note that the rules for brewing Gyokuro depend on its particular kind — very often individual rules must be applied to every particular drink. 4. Houjicha. This kind of Japanese tea is another derivative of Sencha — although, it does not remind of its ‘forefather’ in the least — either in outward appearance or in taste and flavor. The matter is that Houjicha is ‘baked’ Sencha. Sencha leaves undergo heat-treatment, in very different conditions — starting from roasting in special stoves, and ending with ‘baking’ in ordinary ovens. One should note that high-quality Sencha would hardly be treated like this (it is good without it) — so, to prepare Houjicha they use Sencha of poorer quality. However, it does not tell upon the quality of the final product. 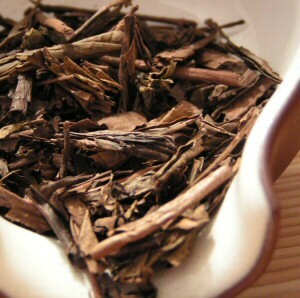 Houjicha tea leaves are of amazing glittering brown color. They are often uneven; tea leaves — pieces of even tea leaves may be mixed with leafstalks and with rolled tea leaves — all of these glitter! And smell of something roasted. This is probably the only way to describe the flavor of dry Houjicha. Well, I may say as well that a sudden wish arises to eat this roasted-smelling tea — but this is a personal emotional experience, so, it is not worth insisting on it. Houjicha is brewed in the standard for all Japanese teas way — infusing for 30-60 seconds, not over-drawing, pouring out all the tea into cups at once. The color of the brew matches the color of its tea leaves — it can arouse suspicion of an inexperienced person. Because being poured into cups, Houjicha has the color close to ordinary black tea — only very light. However this is the normal color for this drink — and this color is right to forestall the flavor and taste of the tea. The taste and flavor of Houjicha are very simple. No other word would suit them better. Drinking Houjicha, one would note to oneself, “Tea. Roasted tea”. Nothing else. But it would be done with satisfaction, because Houjicha’s simplicity is lovely. There is heat and sun rays in it — and they warm you. There is tea in it — with its characteristic taste and flavor. There is a drink in it — Houjicha is also thirst-quenching. Houjicha is perfect to drink after food. The simplicity of this drink makes it compatible with any meal — tea will recede into the background, emphasizing the taste of those dishes which you take with Houjicha. One more thing. Houjicha has a wonderful aftertaste — as if you have just eaten something baked. But no crumbles in the mouth. 5. Genmaicha. Genmaicha is maybe the most exotic of Japanese teas. It is also a Sencha derivative. This time Sencha is mixed with roasted non-polished rice and a little bit (for the sake of aesthetics) of pop-corn. Everything in Genmaicha is surprising. The outward appearance of dry tea leaves, its flavor, the color and look of the brew (infused in the usual Japanese way), taste, and extra potentialities. The outlook is clear — green tea with rice and pop-corn. Flavor is a little bit more complex. There are distinct notes of fish and seeds — but the notes are mild and pleasant. The color of the brew is green — and this is obvious, what else can the color of a green tea be. But rice, contained in the mixture, adds some thickness to the brew and density, unusual for tea. For many people the outward appearance of infused Genmaicha associates with soup — especially after they learn the ingredients of the tea. The flavor of the brew is very thick and rich. Fish and seeds notes are still there, but the flavor of green tea combines with them. And if you are experienced enough in Japanese teas, you will easily recognize the flavor of Sencha in it. 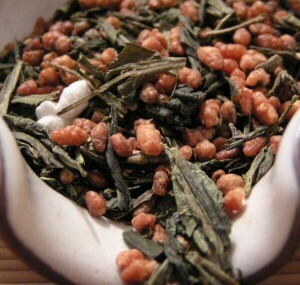 Genmaicha’s taste is very nourishing, substantial. The closest association is chicken broth with an egg. It is not a tea association, and Genmaicha’s taste is different from the taste of chicken broth — but the sensation is similar. Basically, Genmaicha may substitute a light dinner — in case you are hungry at night but do not want to eat before going to bed — Genmaicha can be the best solution, because you will get the feeling of being full without overburdening your stomach. Besides, because of the rice component Genmaicha naturally has a lower caffeine level which is another advantage of this drink as a night tea. Finally, Genmaicha has one more value. From the infused tea leaves, when tea has been drunk already, one may pick out rice. And eat it. Women like such a pastime as much as the tea itself. 6. Matcha. To write about this kind of Japanese tea is the most difficult task. The matter is that traditionally Matcha is the tea for the Japanese tea ceremony and therefore is beyond everyday tea culture (where all the abovementioned teas are included). So, one can understand Matcha only during the Japanese tea ceremony. However, recently, unexpected types of Matcha for everyday use have appeared. For example, sugared instant Matcha for making ice tea, or traditional Japanese green tea jelly. So, it may be necessary to say some words about this kind of tea. Matcha is a powdered tea. Traditionally, it is made of specially grown and prepared tea leaves and powdered immediately before using; often leaves from different regions and of different quality are mixed. During the tea ceremony, Matcha is frothed with a bamboo whisk in some little water — all participants of the ceremony drink this dredge with pleasure and respect. 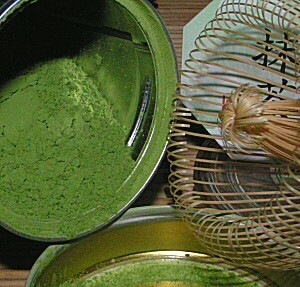 In everyday tea culture pre-powdered Matcha is also used. This ‘powderness’ determines the use of Matcha — as an instant drink, or as an additive to other kinds of tea. When diluted with water, Matcha does not dissolve, but makes a kind of dredge with a very fresh tea taste. When added to other kinds of tea (e.g. Genmaicha), it imparts a peculiar flavor to them and covers every tea leaf with picturesque green coating. That is all about Japanese green teas. To conclude I would like to say some words about medicinal qualities of this drink. Of course, tea is rather a preventive than a remedy, so it is not worthwhile to rely on it as on medicine. Tea does not heal, but it can help to avoid getting ill or to recover easier and faster. It is also natural that medicinal qualities of Japanese green tea do not differ much from medicinal qualities of any tea in general. So, I will give you only two facts connected with Japan directly. First, regular use of green tea helps radiation sickness. The Japanese, unfortunately, had an opportunity to conduct a great number of experiments — and they made sure that the state of health of those citizens of Hiroshima who began drinking a lot of green tea after the atom bomb explosion had substantially improved. It appeared that tea had purged radioactive strontium-90 from the organism, even from the bones of the skeleton. Second, the Japanese determined that women who regularly drank tea before pregnancy gave birth to bigger and healthier babies. In the end, one more remark concerning brewing of Japanese tea. Try brewing it in a cup, not in a teapot. The froth that you will get is evidence of high quality and proper brewing of the tea, and it is quite palatable. Try it!